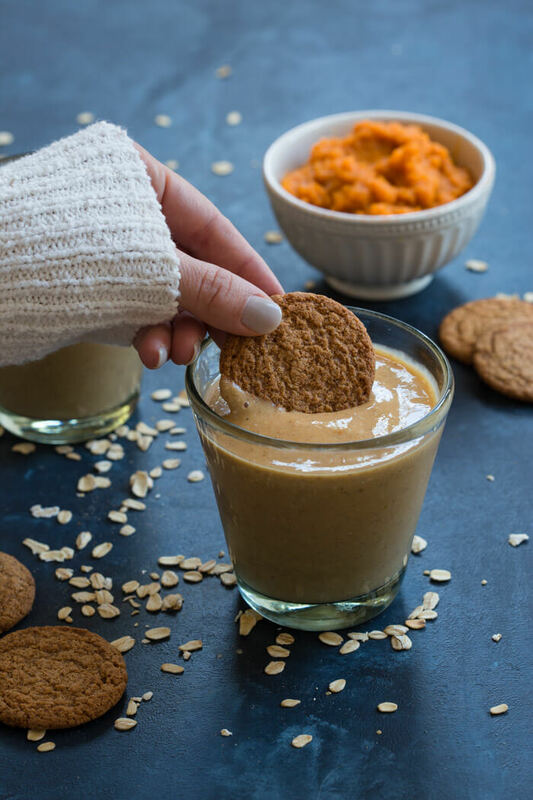 You’ve gotta taste this Pumpkin Pie Smoothie made with frozen bananas, rolled oats, canned pumpkin, almond milk, and pumpkin pie spice! It will get your taste buds jazzed for fall! 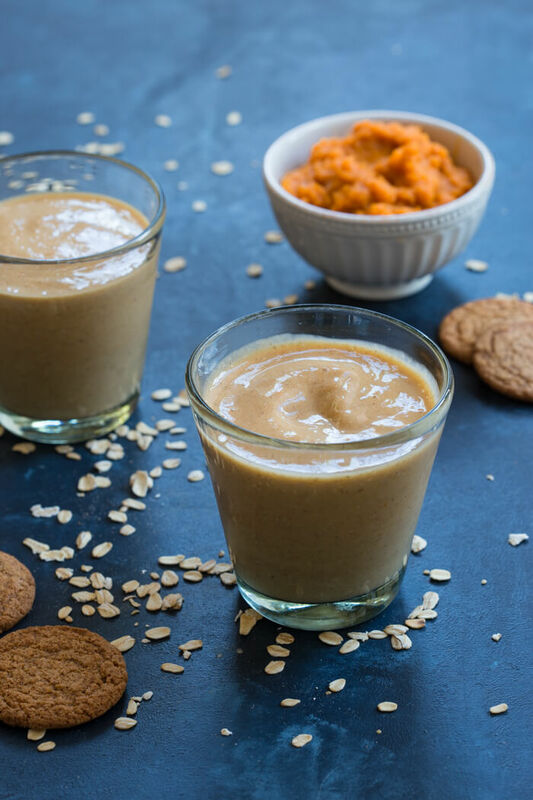 This Pumpkin Pie Smoothie recipe is an oldie but a goodie. It needed to be brought back to life with a little facelift… new photos and an adjusted recipe. I know you’ll appreciate me reviving it because IT’S SO GOOD!! and most of you haven’t seen this recipe before since it was buried deep in the archives from Fall of 2012. I’m so into fall flavors this time of year and pumpkin pie is on the top of the list. 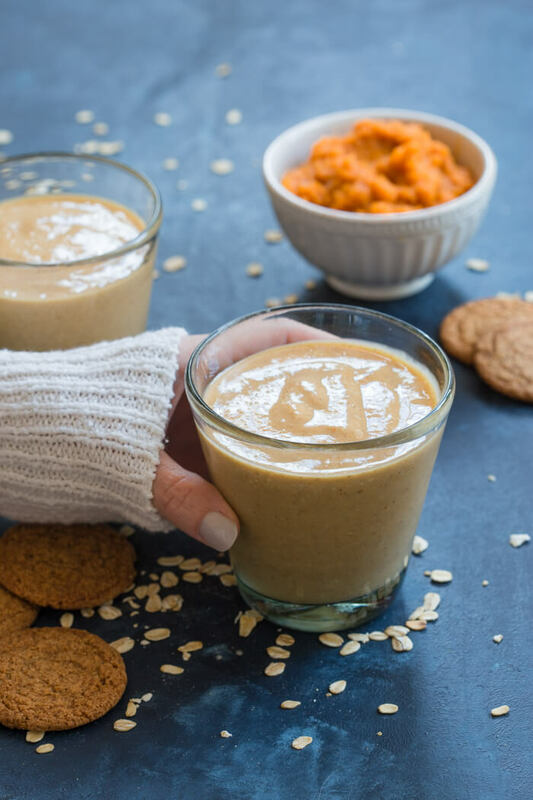 This Pumpkin Pie Smoothie is the easiest way to taste the yummy flavors of the season in a healthy way. I’m all about trying to sneak in veggies when it comes to making smoothies, especially orange ones! Orange veggies (like PUMPKIN) are rich in carotenoids that are good for the eyes and high in antioxidants that ward off disease’s, like cancer. My son is the typical toddler and while he eats well, he prefers carbs (don’t we all?? )– rice, pasta, bread and the like. And he prefers fruit over veggies. So what’s a dietitian mama to do? While I continue to serve him a side of veg along with his fruit and grains, I’m always adding pureed, shredded and thinly chopped veggies into his foods. Pumpkin mac n cheese, yes please! In fact that’s what I made him last night for dinner… boxed mac n cheese with chopped cauliflower and pureed pumpkin stirred in. He left the peas and carrots on his plate, picked the cauliflower out but gobbled up the pumpkin mac along with apples and strawberries. I count it as a win as he did eat the pumpkin. 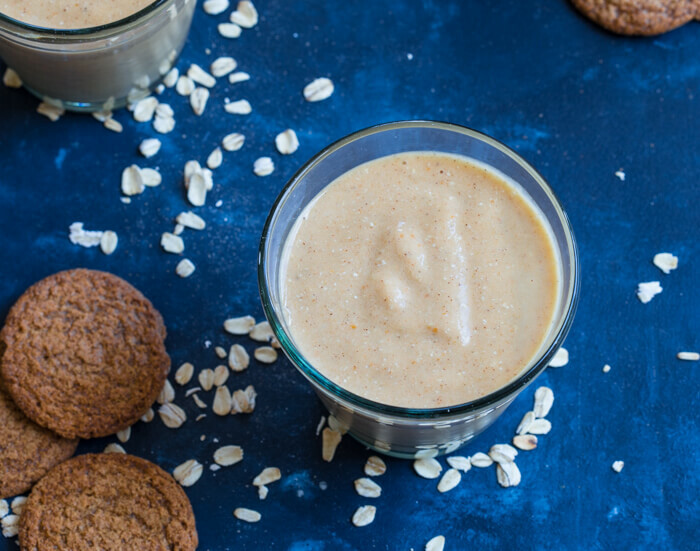 He also drank a little of this pumpkin pie smoothie with his dinner. SO all in all, I count it as a win! We got some orange veggies in his belly without any trouble. You guys, bananas– they make my smoothie life extra creamy and delicious. Let’s talk frozen bananas. Bananas should never be thrown in the trash. Peel them and freeze them. I always freeze uneaten fruit before it spoils, especially bananas. I’ve been known to buy more bananas than we can eat so that we can freeze them too… does that make me a banana hoarder? If so I’ll gladly take the label because frozen bananas are perfect in smoothies (no ice needed) or for these Healthy Banana Bread Muffins with Walnuts or this Classic Banana Oatmeal. 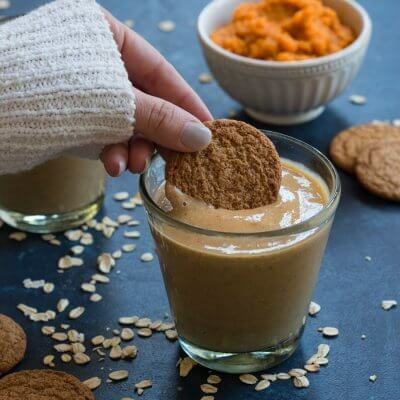 I hope you give this Pumpkin Pie Smoothie a try soon!! 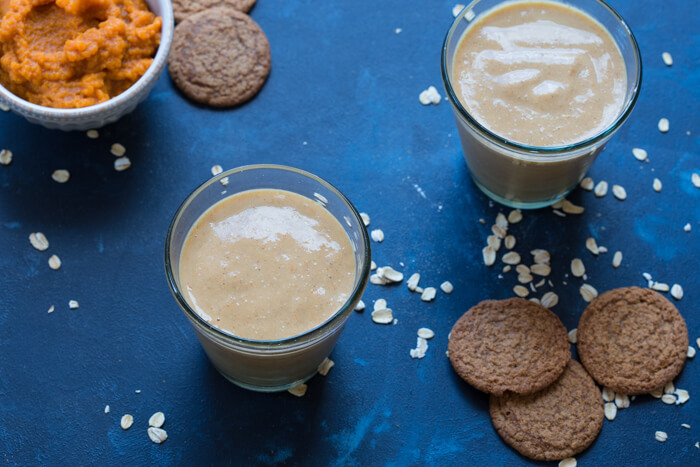 So good and easy to make… just can’t get enough pumpkin this time of year! Place all ingredients into the blender and process until smooth. Pour into two glasses and enjoy immediately. Do you add the otmeal raw or do you cook it first? Added 1/3 cup of plain Chobani and called it dinner. Delicious! I'm a banana hoarder too 🙂 I have to have one everyday! The browner the better. haha! good to know I have a companion! Yum! I'm trying this today! Thanks for sharing!